Mix together flour, baking powder and cocoa powder. Sieve and set aside. In a mixing bowl, beat eggs until foamy. Add brown sugar and beat until light, creamy and fluffy (a soft peak is formed). It takes about 5 minutes. Add salad oil to mix. Add sieved flour mixture from step 1. With a rubber spatula, use folding method to gently incorporate the batter till well combined. Lastly, add in mashed banana to combine. Spoon the batter into the lined cupcake moulds until 90% full. Steam on medium heat for about 15 minutes or until cooked depending on the size of the moulds. Once it’s done, open the lid slightly to release the heat. This is to avoid the cupcakes from shrinking due to change of temperature. After releasing the heat, remove the moulds from the cooking pot or wok immediately and transfer to a cooling rack. Remove cupcakes from the moulds to cool down. These pudding moulds are sold at Daiso. It’s important to use high quality cocoa powder. I used Hershey’s natural unsweetened cocoa powder. You can use corn oil, sunflower oil, safflower oil, canola oil, peanut oil, a light olive oil, or any other fairly bland vegetable oil you can find. I used organic virgin coconut oil. The base of these cupcakes must be supported with moulds, ramekins, teacups or small bowl so they can rise nicely. 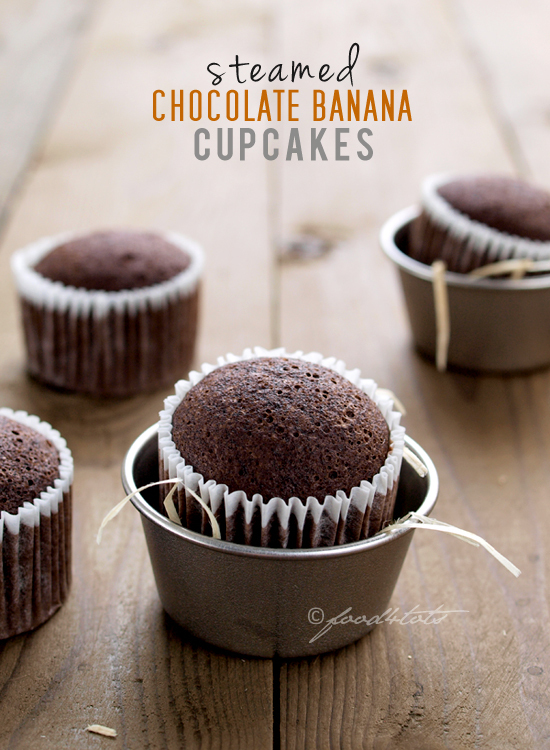 It is not advisable to put the batter on cupcake liners or soft paper baking cups as they are too flimsy. Alternatively, you can grease the moulds with oil and steam without cupcake liners. Extra cupcakes can be frozen in the fridge for later consumption. Before eating, remove from the freezer, thaw slightly and steam again for 10-12 minutes until the muffins are soft. Fill a cooking pot or wok with water. Place a steaming rack. Wrap the lid with a piece of cloth (to avoid condensation during steaming). Bring water to boil. (Refer photo in this post). Hi thanks for sharing this recipe. I just tried it out today and it’s so fluffy and moist. The thing I like most is it’s made without butter! I’m sure I’ll be making this soon again, and double the recipe! 35 queries in 0.208 seconds.